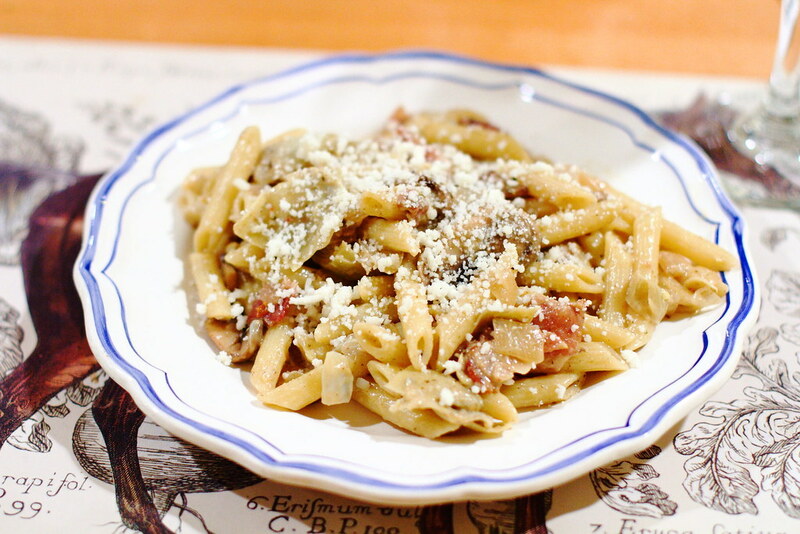 On a particularly rainy day, B and I were in the mood for something rustic and this pasta dish seemed like a good combination of good for you stuff while still feeling hearty. This recipe is actually deceivingly light in that it uses eggs as a thickening agent instead of butter or cream and doesn’t require much cheese for flavor. And it doesn’t hurt that artichokes and white wine go together like peas and carrots! In a saucepan, heat the olive oil over medium-low heat and add the pancetta, stirring and cooking until rendered. With a slotted spoon, remove pancetta from pan and set aside. Add onion and cook until they begin to soften. 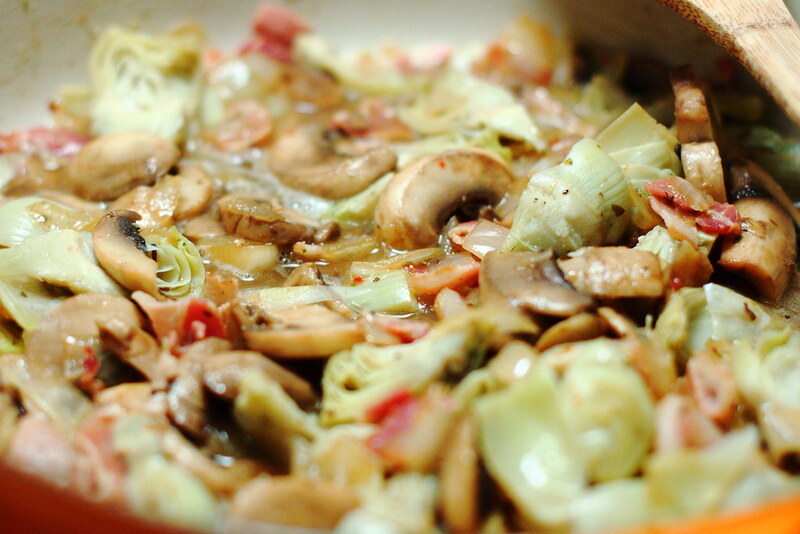 Add the mushrooms and cook until soft and brown. Drain the artichokes and add them to the pan, stir to mix well, and heat through. Bring water to boil for the pasta and cook according to the instructions al dente. Beat the eggs in a small bowl and beat in the grated cheese. Season the vegetables with salt, then add the pancetta and wine, stirring frequently until the wine evaporates. Reduce the heat to low and add the pasta, mixing gently so pasta absorbs the sauce. Remove the pan from heat and slowly stir the egg mixture until penne is fully coated and creamy. 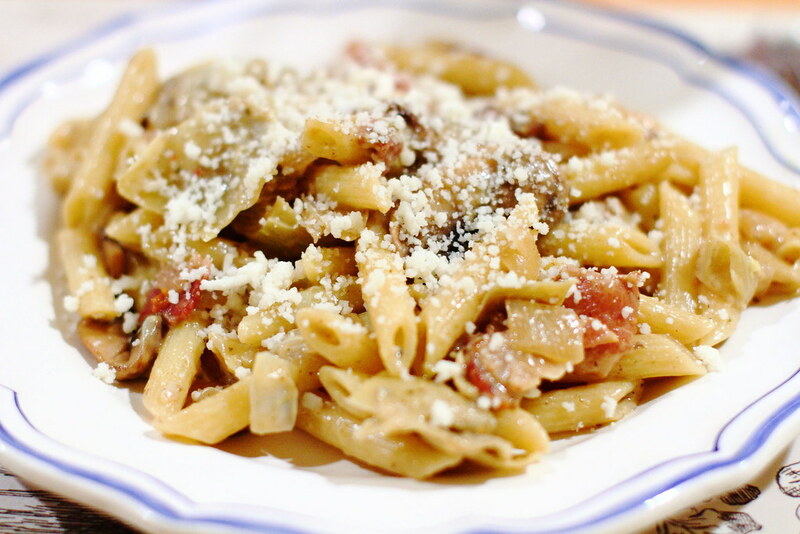 Serve warm with additional parmigiano-reggiano if you like and enjoy! So it's a bit like a carbonara then? Love anything with artichokes and mushrooms, so I would definitely like to try this! Two of my favorite vegetables.